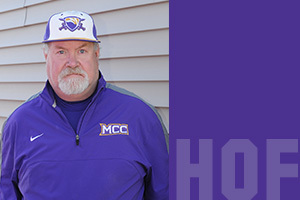 Tom Carle served as an athletic department volunteer 1993-2015, serving as scorekeeper at basketball games and volunteer baseball coach. He volunteered his time and monies to help improve baseball field and facilities during this time. He donated countless hours to the programs, players and our college. He is currently retired, substitute teaching in the area and residing in Woodstock.